We received permission from Alberto Garcia Lamela to post this guest blog post. The original post here. This is a pragmatic guide to Ansible for beginners. This use case will guide you on how to set up a cross-cloud software defined network for containers using Weave Net, Weave Scope and Docker. There is a full gitbook including also a theoretical introduction to the main concepts of Ansible. This tutorial will assume that you have two machines running coreOS on DigitalOcean and AWS. You can create them manually or using something like Terraform or docker-machine. We provide the docker-machine-bootstrap script so you can use it and modify it for this purpose. We’ll use the public IPs of these machines to create the weave network. Make sure your AWS security groups configuration match the Weave requirements. For this demo I used a totally open configuration. If you don’t want to create these machines you could use any machine with docker and systemd reachable via ssh from where you are running Ansible. At the end we’ll deploy two containers that will communicate with each other: one in DigitalOcean and another in AWS. Before reinventing the wheel you should try reusing community modules. Ansible galaxy is a website for sharing and downloading Ansible roles and a command line tool for managing and creating roles. You can download roles from Ansible galaxy or from your specific git repository. 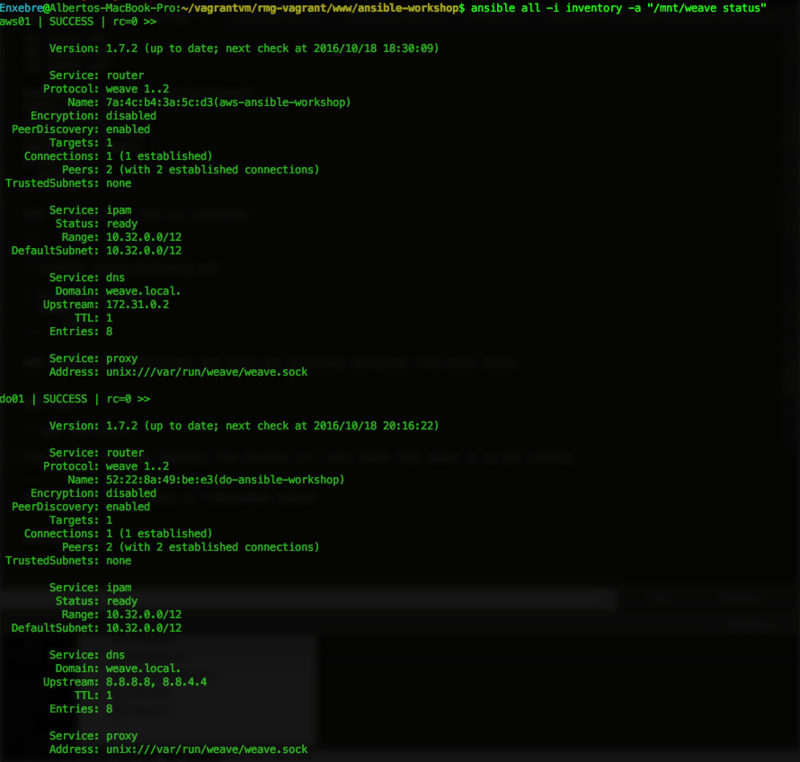 Ansible allows you to define your dependencies with standalone roles in a yaml file. See requirements.yml. By default Ansible assumes it can find a /usr/bin/python on your remote system. The coreos-bootstrap role will install pypy for us. Certain settings in Ansible are adjustable via a configuration file. Click here for a very complete template. We’ll set here the target folder for our community roles. Boostrapping ansible dependencies for CoreOS. The Inventory and the Playbook. We’ll create an inventory so we can specify the target hosts. You can create meaninful groups for your hosts in order to decide what systems you are controlling at what times and for what purpose. You can also specify variables for groups. We set the CoreOS specifics here. We’ll create a playbook so we can declare our expected configuration for every host. In this step our playbook.yml will only include the role downloaded previewsly on every coreos machine (just one so far). By default. Adding a new machine on a different cloud. Inventory groups. You will see it fails for aws01 as the python interpreter is not there yet. So let’s apply the playbook again. So far we have used Ansible to set up a python interpreter for the CoreOS machines so we can run Ansible effectively as many modules rely on python. In this Step we’ll setup a Weave network and Weave Scope between both clouds so docker containers can communicate with ease. We add a new role dependency on the requirements. <code>ansible all -i inventory -a "/mnt/weave status"
Templates and variables from other hosts. Weave needs to know the ips of the different host of the network. Ansible provide some magic variables so you can get information from the different hosts while running a playbook. This templates are populated at runtime by using hostvars magic variable. In this step we’ll use the power of tags and conditional in order to deploy some services running on docker so we can test that they can communicate from DigitalOcean to AWS. We’ll run this on demand by using the conditional when: deployment_enabled and tags. 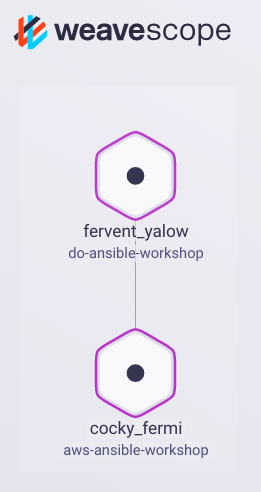 <code>ansible-playbook -i inventory playbook.yml --tags="deployment"
weaveworks/gs-spring-boot-docker is running on AWS now and weaveworks/weave-gs-ubuntu-curl is running on DigitalOcean. 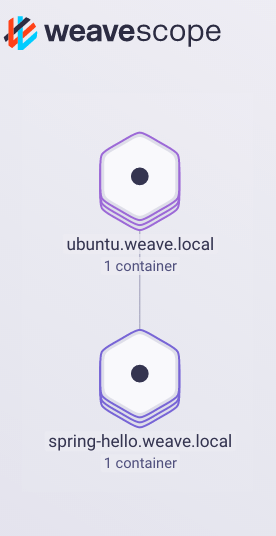 If you check the logs for the weaveworks/weave-gs-ubuntu-curl container or you run curl http://spring-hello.weave.local:8080/ inside the container you’ll see how is communicating with the weaveworks/gs-spring-boot-docker container that is running on AWS. You can also check the connection on Scope. Hopefully, You’ll now have a better idea about the strengths of Ansible and how to make the most out of it. Check out the full gitbook including a “Concepts” section.